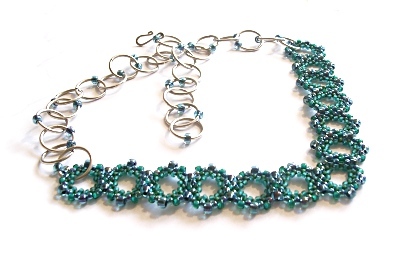 The third piece in my Honeycomb Beadwork series, this necklace was published as a project in the February/ March 2006 issue of Beadwork Magazine under the title ‘Beading In Circles'. Using exactly the same technique as the previous pieces in the series, this necklace simply joins the two of the motifs at an angle to create the v-shaped centre. I used large silver jump rings to finish the necklace to reflect the circular motifs and give it a contemporary look. Joining the motifs in this way led me on to trying out different directions.